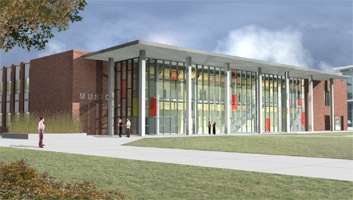 The finished renovations of the Music and Performing Arts Building will result in a 47,751 square foot building, for a total project cost of $14,948,000. The building will house classrooms and new office space as well as a state-of-the-art recording studio on the lower lever, with a new two-story office addition on the west wing. ALLWEST provided soils density testing for the building addition from the foundation of the basement to the finished grade, including the sidewalks and building pad. We were instrumental in the shotcrete process plans, observing all placement and sampling, ensuring that the all steel reinforcement steel conformed to the plans and specifications. We observed and tested the concrete placement to ensure that all codes had been met and clearance was correct. Additionally, ALLWEST inspected the structural steel and bolting for conformance with code and AWS D1.1.